Mix entertainment with nature while taking in an open-air show at Miller Outdoor Theatre in the Museum District. Located atop Hermann Park‘s massive hill, this evergreen mainstay does more than offer stunning views of the surrounding park, museums, and Medical Center. 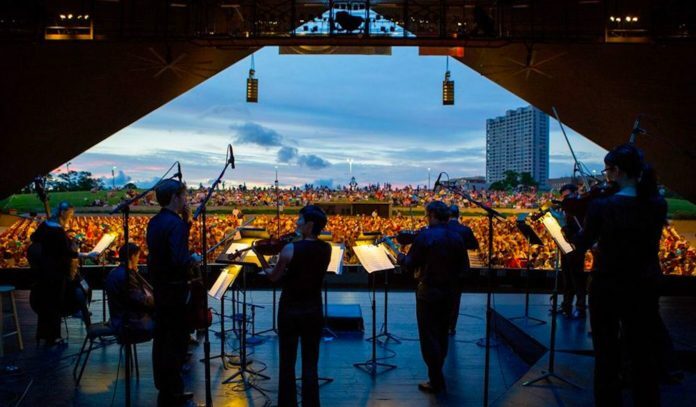 The largest program of its kind in the U.S, the outdoor venue hosts 125+ artistically and culturally diverse free performances each year, attracting multi-generational, multicultural audiences of more than 450,000 annually. Opened in 1923, Miller has become a beloved cultural treasure, and to this day offers a wide variety of programming including, daytime shows for young children, family-friendly evening performances of classical music, jazz, world music and dance, ballet, Shakespeare, musical theatre, concert artists, films, special holiday performances and more. Covered seating is ticketed but free, and is available at the theater box office on a first come, first serve basis. Click here for an up-to-date schedule of upcoming events at Miller Outdoor Theatre. 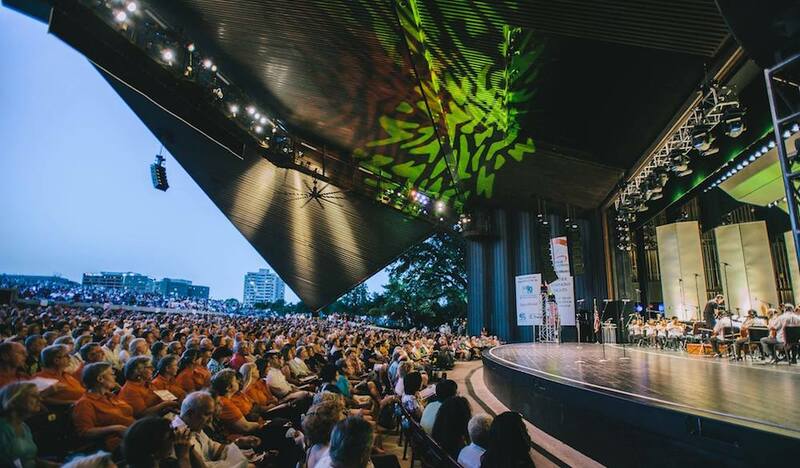 Offering an eight-month season of professional entertainment, Miller Outdoor Theatre focuses on culturally diverse and artistic shows that are always free of charge to the public. Surrounded by gorgeous greenery, Miller can accommodate nearly 6,000 spectators between its manicured lawn and theater seating—and still somehow manages to never leave you feeling confined. Seating ranges from open-air covered seating to outdoor seating on the theater’s hill, where visitors can bring blankets or lawn chairs to relax on their own terms while taking in a show. The fully-functional theatre structure is located on approximately 7.5 acres of land and features a 64×41-foot stage, an orchestra pit which can be raised and lowered, and during the summertime, a 110-ton air conditioning system which cools the entire performance area. Food and drinks are available for purchase at the theater’s concession stands. All performances continue rain or shine. Click here for an up-to-date schedule of upcoming events at Miller Outdoor Theatre. 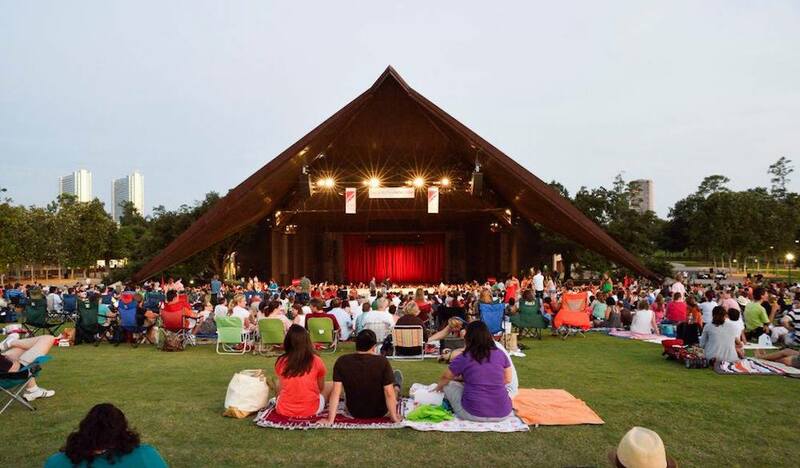 Located within Houston’s beloved Hermann Park, Miller Outdoor Theater is smack dab in the middle of the Museum District surrounded by as many as 19 museums. Whether it’s just a performance you’re looking for or a fun-filled day packed with museum hopping, the area sets visitors up with a bevy of mainstay options within walking distance of Hermann Park. While you’re there check out area favorites including the Houston Museum of Natural Science, Museum of Fine Arts, Houston, Houston Zoo, Children’s Museum of Houston, Rothko Chapel, Houston Center for Contemporary Craft, Lawndale Art Center and Mural Project, Czech Center Museum Houston, and Houston Center for Photography. Hours: Times vary by event. Click here for a full schedule of upcoming performances. Parking: Free lot and paid street parking is available in the surrounding area. Look for lots in front of the Houston Zoo, at the McGovern Centennial Gardens, and the Bayou Parkland Pavilion. Free parking is also at the golf course clubhouse at Almeda and McGovern. Admission: No cover for both lawn and covered seating. Free covered/reserved seating is available to be picked up (4 max per person ages 16 and up only) at the box office from 10:30am to 1pm. The box office is located on the northeast corner of the Theatre. Remaining tickets are given out one hour before curtain. Assigned, ticketed seats will be held until 5 minutes before the performance starts. Any unclaimed seats are released 5 minutes before the show begins. Food and drinks are available for purchase. Additional research and reporting by Theresachristine Etim.